In large resealable food-storage plastic bag, mix Bisquick mix and pepper. In medium bowl, beat eggs slightly. Stir in chicken until coated. Using slotted spoon, remove chicken from eggs; place in bag with Bisquick mix. Seal bag; shake bag until chicken is coated. In 12-inch skillet, heat 1 tablespoon of the oil over medium-high heat. Add carrots; cook 2 minutes, stirring frequently. Add bell pepper and onion; cook 2 minutes longer, stirring frequently. Remove from skillet. In same skillet, heat remaining 3 tablespoons oil. Add chicken; cook, stirring frequently, until golden brown on outside and no longer pink in center. Add vegetables; cook about 2 minutes, stirring frequently, until hot. 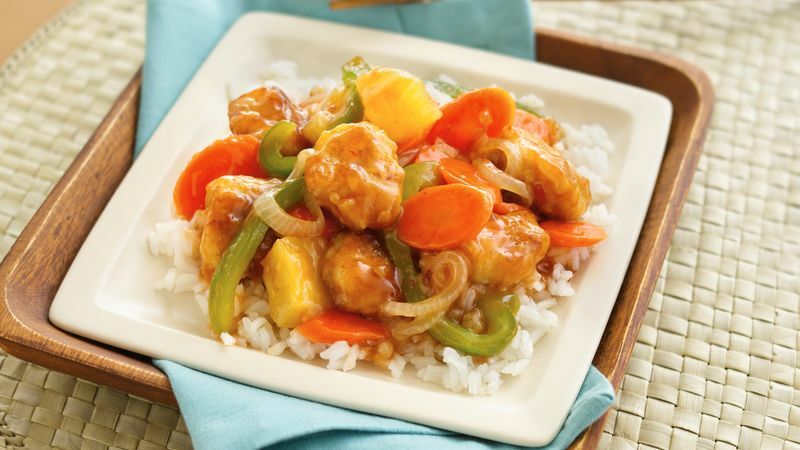 Stir in pineapple and sweet-and-sour sauce; cook until hot. Serve over cooked rice. Buy chicken already cut up for stir-fries from larger supermarkets. This stir-fry chicken recipe first appeared in a 1986 magazine ad. Zucchini or broccoli work well in stir-fries, too.